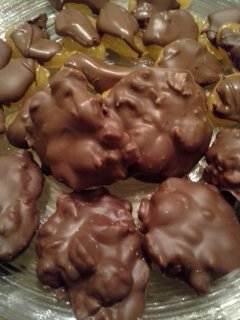 The other day, I made some amazing chocolate covered peanut clusters. 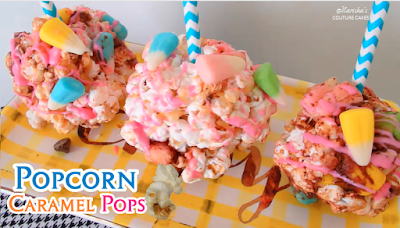 I made a post on Facebook about them and ended the post with "Homemade Fun". So true. 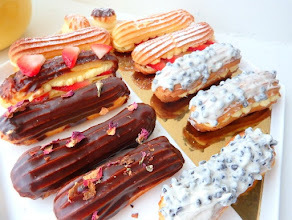 Why purchase expensive chocolates when you can have fun creating your own! Visit your local market and pick up a few bars of chocolate (I prefer Belgium). Melt them down and go crazy!! One of my newest favorite chocolate candies are "Turtles". In case you're thinking I'm a seafood dipped in chocolate lover, allow me to explain. Chocolate turtles are basically a cluster of caramel and pecans dipped in milk or dark chocolate. In my family, one of our holiday traditions are to have candies, nuts and fruit out on the table for guests. Sooo...since I have all of the ingredients including candy wrappers, I figure why not. 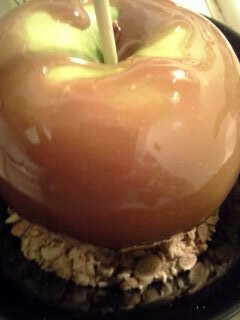 I feel a recipe coming on....BAM! On a sheet tray with waxed paper, arrange the pecans in a cluster of 5 in the shape of a turtle or a star. When hardened, peel your candy off of the parchment and cut into small squares about 1 1/2 in. thick. Melt your chocolate using the double boiler method or microwave method (stir every 30 seconds). Chocolate should reach about 85 degrees. Be careful not to burn. Allow your chocolate to cool down, then dip each piece of caramel into your chocolate (try using a fork) and set on a piece of waxed paper to harden. Store in an air tight container for up to 2 weeks. Here are some other ideas. 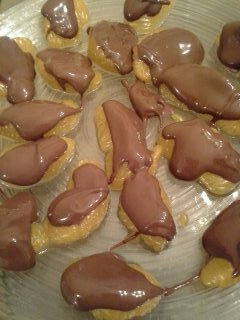 My personal favorite, chocolate dipped tangerine slices. 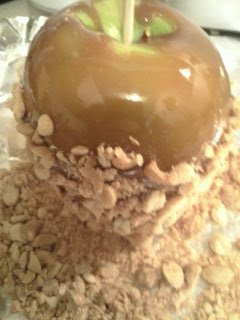 And my homemade caramel apple. Too legit to quit!